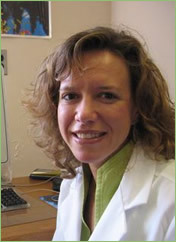 Mónica M. Kurtis, MD, arrived from Madrid to join our team in July 2006. She completed her first two years of undergraduate studies at Princeton University and finished her degree in Biological Sciences at the University of Edinburgh. She then returned to Spain, graduating from the University of Navarra School of Medicine, after spending one year as an Erasmus Scholar at the Université Paul Sabatier in Toulouse, France. She completed her neurology residency at the Clínico San Carlos Hospital in Madrid. Dr. Kurtis has published and presented clinical research in a wide range of neurological topics, and is particularly interested in novel methods of diagnosis and treatment for dystonia, Parkinson disease and related movement disorders. Due to her varied and multicultural background, Dr. Kurtis is trilingual in Spanish, French and English.